The first thing that came to mind after viewing Claimed is that in this eleventh episode of The Walking Dead‘s fourth season, for the first time in a long time they got something almost entirely right. I’m not saying that Claimed was a perfect episode, or that it didn’t have its flaws – but it was an amazing balance of suspense, character back stories, and moving the plot forward. 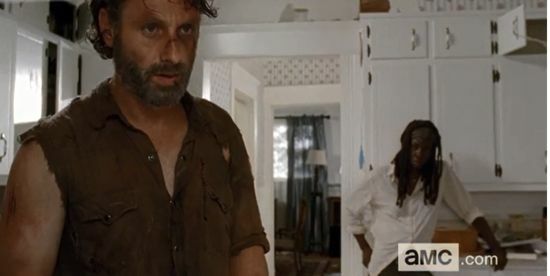 While I’m still not certain that I find Michonne and Carl’s rapport consistently believable at this point, I can’t imagine a better setup than pairing her with Rick and Carl. They think they’ve lost Judith, and Michonne knows that pain – this is really the most believable way for the viewers to finally hear about some of her past. While it feels like we are still being teased with bits and pieces – the ‘one question per room game’ seemed a bit campy, for instance – I hope that even though Rick, Carl, and Michonne are back on the road for a bit, the writers will continue to find ways to flesh out the viewers’ understanding of Michonne’s past. 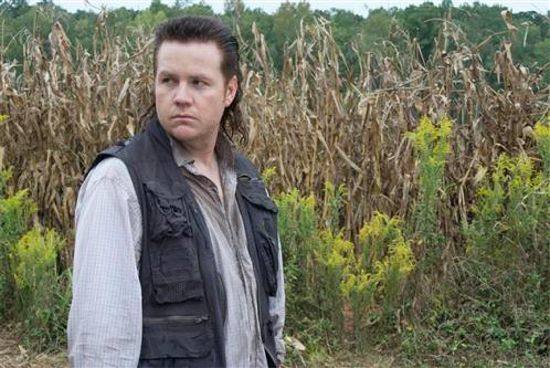 Though we’ve still been left with questions about the new characters of Abraham, Rosita, and Eugene; it was also a breath of fresh air to not have their general goal kept secret for an extended amount of time. However, Abraham’s conversations with Tara left me wondering if I’d somehow missed an episode. They were talking to each other as if they’d had similar discourse several times in the past, but of course we know that they just met – and Tara wasn’t even riding in the cab of the truck with him. Despite the fact that at times Claimed felt disjointed, one thing it had in abundance was suspense. Michonne finding the creepy painting, followed by her lone foray into the back rooms of the house she and Carl were searching; Rick waking up to a house full of clearly violent men; even Eugene struggling with the gun as walkers came spilling out of the cornfield – all of this balanced out the more exposition-filled scenes of the show. Perhaps it was all just suspense for the sake of suspense, but it was well done. In terms of this episode driving the plot forward, Rick & Co. have been forced out of their ‘safe house’ and are now on their way to the sanctuary that Tyreese, Carol, the Samuel girls, and Judith will hopefully arrive at soon as well. Additionally, Eugene may have killed Abraham’s truck, but in doing so it kept our new characters with Glenn and Tara, and they’re hopefully headed in the right direction to reunite with Maggie, Sasha, and Bob. Though After was a slow start to the second half of season four, with Inmates and now Claimed, I can safely say that if Walking Dead continues at this pace we are likely in store for some of its best storytelling since its superior first season.